The rooster, hen and three chicks can be displayed indoors or out. 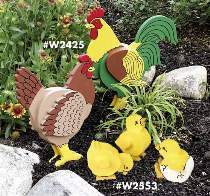 Each chicken is made from 5 layers of 3/4" stock, giving a very realistic 3 dimensional look. Both plans feature FULL SIZE patterns and complete painting instructions. Rooster measures 19"H and the Hen is 16"H. Order one pair of Amber eyes for each chicken and each chick or see *Special which includes both plans and enough eyes to make all five chickens.